Confectionique: June: Vintage Americana Market! Join us for Nuit Blanche on Thursday June 6th from 5pm-8pm and share a complimentary glass of wine with us while we kick off our long-awaited summer with our "Vintage Americana" Market! We're celebrating Life, Liberty and the Pursuit of all things Summer! And remember . 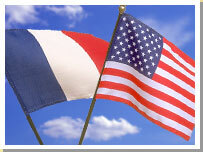 . . there's a reason both the American and French flags are red, white and blue! The market continues Friday June 7th from 11am-2pm, Saturday June 8th from 10am-4pm and concludes on Sunday June 9th from Noon-4pm.